Nightline is a confidential, anonymous listening and information service provided by student volunteers. Our service provides a safe environment in which our users feel able to talk about their concerns and feelings without fear of judgment. We uphold no political, religious, ethnic or cultural bias. A non-judgmental, friendly and empathetic ear. Whether it be to talk through a concern, simply have a chat. No problem is too big or small and we’ll always listen, not lecture. We are a non-advisory service, but do provide information. Anything from take-away and taxi numbers to specialist helplines. Prefer to email? Any time, day or night. Our ‘anonymiser’ program ensures that volunteers do not know your email address. We aim to reply to emails within 48 hours, and this service continues outside termtime. Calls are free from all university phones - just use the extension number in brackets. The number is also on the back of your U-card. We want enthusiastic, dedicated and empathetic students to join our call taking team! If you’re a good listener who can work well with other students and have a high standard of written and oral English, we’d love for you to apply to volunteer with us. Nightline provides full training for all our volunteers to ensure our call takers feel confident and prepared to take calls, however this can take a while so sadly we can’t take on final year students as new call takers. 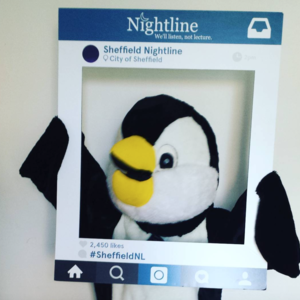 Applications to become calltakers are currently closed for Nightline this semester, but will be open again in the Autumn Semester - please email sunl@sheffield.ac.uk if you want to get involved! If you feel that this role is not for you, or cannot fulfil one of these requirements, you could still be involved with the Nightline Street Team. The Street Team publicise across both University of Sheffield and Sheffield Hallam campuses. If you are interested in this role please look out for another email from us in the near future, as we will soon be recruiting.